Imagine calling him “Jesus the Bethlehemite.” Hmm. Well, we’d have got used to it. As we know from Luke, both Mary and Joseph were originally from Nazareth, but had to go to Bethlehem for survey reasons, and Jesus was born while they were there. But Matthew never told that part of the story; only that Jesus was born in Bethlehem. Mt 2.1 If all you had was that gospel, you’d think that’s where they lived already. And maybe that’s what the author of Matthew believed. ’Cause what happened was after Joseph took the family to Egypt to escape Herod’s mad little bout of infanticide, God finally lets him know it’s safe to return… and in returning Joseph “came to settle in a city called Nazareth,” Mt 2.23 KWL which implies he hadn’t already settled in Nazareth, and just hadn’t been home in a while. Well. Assuming, as most of us do, that Jesus was born around the year 7BC; that he was about two-ish when Herod came a-killing (round 5BC), and that the reason they needed to hightail it to Egypt was because Herod wasn’t gonna die for a while (which he did in late March 4BC), that’s roughly the time we’re talking about. 20 saying, “Get up. Take the child and his mother. 21 Getting up, Joseph took the child and his mother and went to Israel’s land. 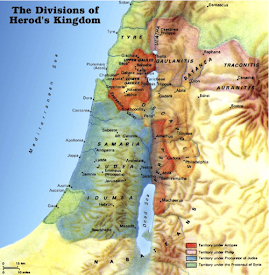 22 Hearing Archelaus Herod was made Judea’s king after his father Antipater Herod, Joseph feared to go there. After negotiating in a dream, he went back to a part of the Galilee. But as you can see, once Joseph got back to Israel, he realized Judea was in no way a safe place to raise Jesus. ’Cause the Herod family was still in charge, and the crazy side of the Herod family was still in power. Little bit of backstory. In 4BC, Herod had a Roman eagle placed over the temple’s entrance. Outraged at what they considered idolatry, some rabbis and their students chopped it down with axes. Herod had them arrested and burnt to death. Then he used it as a pretense to execute all the males in the Hasmonean royal family—the family he overthrew when he became king. Then he changed his will, went to Jericho, and died. Probably kidney failure. Augustus Caesar had given Herod permission to name his successor, and following Hebrew custom, Herod divided the territory among his sons, and gave the one with the birthright the “double portion”—twice what the other sons got, plus the title of basiléos/“king.” Having executed his elder sons Aristobulus and Alexander in 7BC, and irritated at the time with his other sons Philip and Antipas, he gave Archelaus the birthright and title. Before he could go to Rome to confirm his title, Archelaus held a reception in Jerusalem, which quickly turned ugly as the crowd demanded release of political prisoners, the death of those who’d executed the rabbis and their students, and the appointment of a better head priest. Archelaus shut the reception down, and when a protest erupted later that night in the temple, he sent in the troops to kill all the protesters—about 3,000 of them—and cancelled Passover. Augustus actually found this behavior impressive. Decisive. Kingly. It was, he figured, an attack on Roman sovereignty, and Archelaus had acted even before he was given any title. This, the emperor figured, made him worthy to succeed his father. Though Archelaus’s brothers contested the will, Augustus appointed him ethnarch/“ruler of the nation”—not officially, but technically, king. He was given Judea, Idumea, and Samaria; Antipas received the Galilee and Perea; Philip got Gaulantis, Trachonitis, Batanea, and Aurantis; and Herod’s sister Salomé was given a small territory. Archelaus kept up the tyrannical behavior, producing wave after wave of complaints to Augustus. (And his brothers plotting against him were no help.) Nine years later, in the year 6, the emperor finally fired and banished him to Vienne, Gaul (now France). Legend has it he killed himself soon after. Anyway, those were the current events when Joseph returned to Judea. Realizing this was no safe place to raise Messiah, he balked and wound up back in the Galilee. ’Cause you recall, the angel’s instructions were to return to “Israel’s land,” which means they weren’t just limited to Judea. Could’ve moved to the Galilee, the Decapolis, Perea… really anywhere in Palestine. There are two ways people have interpreted verse 22. The most common is the way the KJV renders it: “…Being warned of God in a dream, he turned aside into the parts of Galilee.” Mt 2.22 KJV Apparently Joseph knew it wasn’t safe in Judea, but stupidly decided to tough it out, figuring God would provide. At some point God had to give him an extra warning so he’d head up north. This is the preferred interpretation of literalists, who think we can’t act till God first spells out every last step we have to take; who think those brains he gave us are wholly unnecessary accessories. Contrary to popular belief, visions aren’t one-way communication, where God tells us how things are gonna be, and we just passively lie back and take it. That’s not how any of the visions took place in the bible. Visionaries responded to their visions. Prophets talked back to God, or God’s angels. Sometimes the prophets freaked out, too. Sometimes they objected. Sometimes they had questions. We Christians, particularly those who’ve had no experience with visions, tend to talk about them as if prophets are dumbstruck fools, so awed by the fact God speaks with us, that we forget God likes to speak with us. God wants a relationship! Relationships require interaction. Joseph had a relationship with God such that he could negotiate with God. Don’t we? Shouldn’t we? Joseph regularly spoke with God and his angels in his dreams. So he knew all he’d have to do was wait till night, have a conversation with God, and get the okay to move the family back home. He wanted to move north; he he wanted to know if God was fine with it. Turned out he was. But maybe Joseph was concerned the Father wanted Jesus to grow up as “Jesus of Bethlehem,” like the prophecies described Messiah. Plus all the good schools were there. And the temple. And the centers of power. According to most folks’ understanding back then of what Messiah was supposed to be, Bethlehem would be an ideal location to raise Jesus. But not to God. Here’s where “He’ll be called ‘Nazarene’” comes up. Joseph came to settle in a city called Nazareth. The word means a resident of Nazareth, and eventually Jesus did become known as Jesus the Nazarene. (Or “Jesus of Nazareth,” as most bibles put it.) His followers also were called Nazarenes for a while. But this “word through the prophet” isn’t found anywhere in the scriptures. There are no prophecies which refer to Nazareth at all. As I pointed out previously, the city wasn’t founded till the first century BC. After Old Testament times. Scholars figure the reference to a prophecy about Nazareth must therefore be a bit of Hebrew wordplay on Matthew’s part. It might come from nazír/“Nazirite,” a person especially dedicated to God. Nu 6. Or from natzér/“sprout,” which Isaiah used poetically to refer to a branch growing from “Jesse’s stump” Is 11.1 —so that’d be Messiah. It’s frequently claimed the ancient Hebrews were big fans of puns and wordplay. Personally, I think it’s that interpreters—both back then and today—like to take a word in the bible, pull it out of context, and stretch it like Silly Putty till it fits where they want. This abuse is so common, loads of people treat it like it’s okay. And not only okay: Look, the author of Matthew did it too! So that’s why I’m loath to say this is what Matthew means. There’s a more recent interpretation that Nazarene was first-century slang for “hillbilly” or “bumpkin”—for a despised, looked-down-upon village. You remember Nathanael’s comment, “From Nazareth? Can he be any good?” Jn 1.46 because Nazarenes were considered worthless. And so, because Jesus identified with a despised town, it kinda fulfills the prophecies that Messiah was despised and rejected. Ps 22, Is 53 That idea, I like better. I don’t embrace it, but I prefer it to the wordplay idea. The fact is, we really don’t know where the author of Matthew got his quote, and we’re spinning our wheels trying to justify it. The theory I go with, is the author got it from some non-biblical prophet. Like Symeón. Why not? Who says this prophecy had to come from the bible?